President Peter Stoicheff at the April 8 GAA. At his first address to the General Academic Assembly (GAA) on Friday, University of Saskatchewan (U of S) President Peter Stoicheff announced his commitment to three key initiatives related to reconciliation, sustainability and examining the feasibility of the Emma Lake Kenderdine Campus. Stoicheff said the Emma Lake Kenderdine Campus has been top of mind for him since it was temporarily closed in 2012. "I will sponsor the development of a site plan and vision for the campus," he said, adding that a site plan and vision for the campus are necessary steps to any potential re-opening. "The Kenderdine campus offered a number of great experiential learning opportunities for our students and was also a great way to engage with the larger community," he continued. "A vision and a site plan will allow us to attract financial support and partnerships to ensure the campus is sustainable and that it suits the university's academic mission." 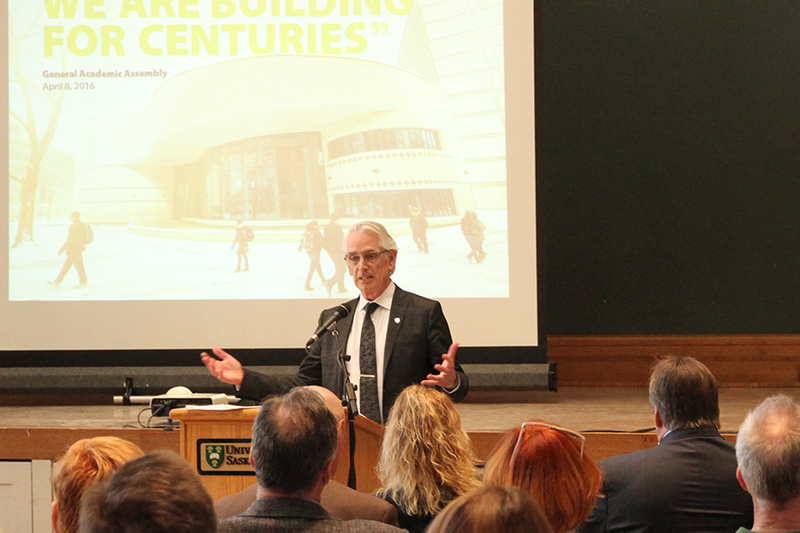 Sustainability was another topic Stoicheff said is important to his presidency and an area that needs to be strengthened at the U of S.
"There are a number of sustainability initiatives on campus of which we can be proud," he said. "But there is always more that we can do in this area. My office will continue working with our excellent Office of Sustainability to determine which campus-wide initiatives are priorities we can support." The president said he aims to support opportunities for students to work on sustainability issues on our campus and in our communities. The third project Stoicheff highlighted was a campus-wide Truth and Reconciliation forum aimed at building on the momentum from November's National Forum on Building Reconciliation hosted by the university. The U of S forum will identify what is being done on campus to address the Truth and Reconciliation Commission's recommendations, and what future initiatives will include. Since being installed as president, Stoicheff has talked extensively about the importance of narrowing the educational gap between Aboriginal and non-Aboriginal people. "We are committed to this across our institution and we will strengthen our efforts to ensure the success of our Aboriginal faculty, staff and students," he said. "This is imperative to the success of our communities in Saskatchewan, Canada and beyond." The GAA is composed of the president, vice-presidents, registrar, deans and directors employed by the university or an affiliated or federated college, as well as all full-time faculty members and a number of U of S students. This annual, public meeting is held to hear the report of the president regarding the state of the university and any other matters that the president considers appropriate.